The NVR Domain Controller and child NVRs must be connected to the Internet or the same LAN. To establish logical connection between child NVRs and the NVR Domain Controller at least one user in every child NVR and in the Domain Controller must be set as Exclusive Master User. A child NVR administrator must provide the NVR exclusive master user login name and password to the NVR Domain Controller administrator. The NVR Domain Controller administrator in turn must provide the Domain Controller exclusive master user login name and password to every child NVR administrator in the domain. As far as the purpose of creating the Exclusive Master Users is establishing the connections in the domain — just a few parameters should be setup. 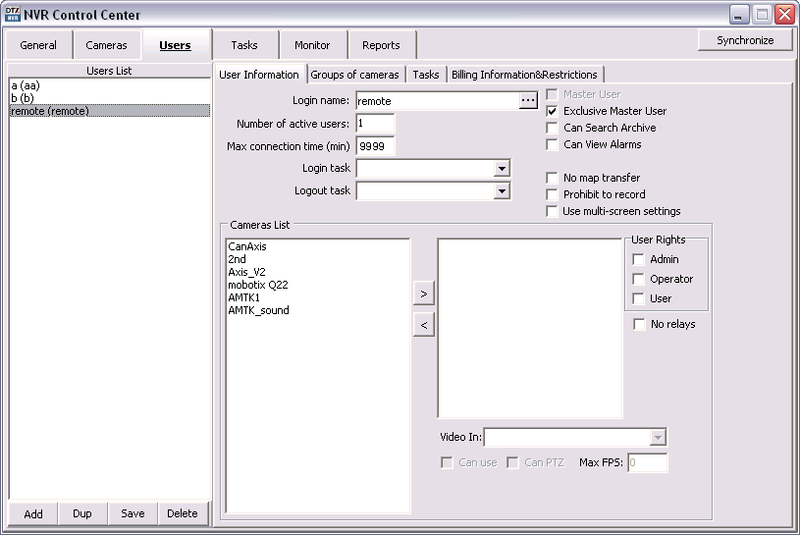 In the NVR Control Center — Users click Add button below the Users List to create a new User. In the User Information click the button next to the login name field to enter Login Name, Full Name and Password. Enter the Number of Active Users equal 1. Enter Max connection time equal 9999 (no time limit). Check Exclusive Master User checkbox to give the user exclusive connection rights in the domain. 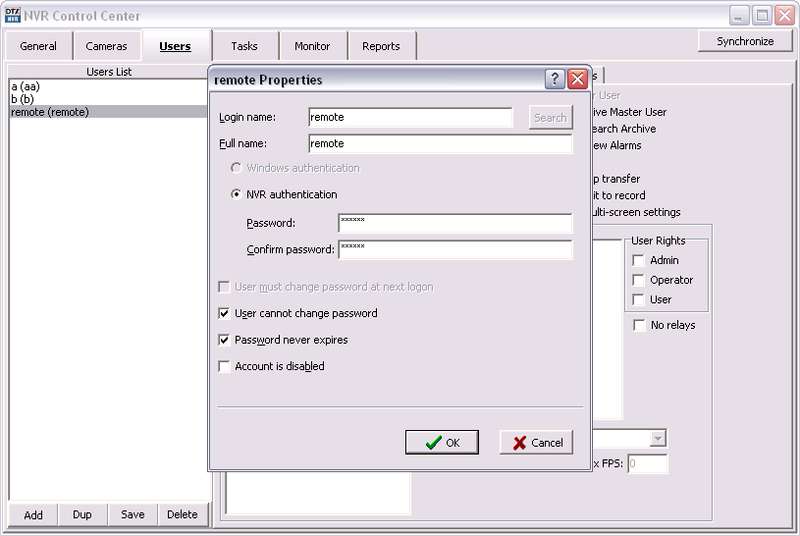 In the NVR Control Center — Users — User Information click the button next to the login name field. Enter a single word, case-sensitive, alphanumeric Login name to use to login to the NVR and any descriptive Full Name. Enter a single word, case-sensitive, alphanumeric User Password and re-type it to Confirm Password to be sure it is typed as desired.